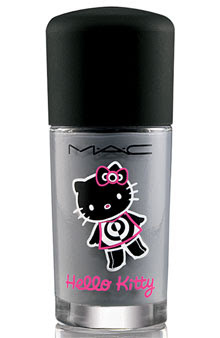 This is our 3rd product review from the MAC Hello Kitty collection. Our first review was for the Hello Kitty Brush Holder Set and our second was for the lustre lipstick in "Most Popular". Tester: Multi-Ethnic, (Jamaican/German) about Lisa Bonet's shade. "The American saying: "3rd time is a charm" has never been more true than for this 3rd item I've tried from the MAC Hello Kitty collection. The color/bottle had me at "Hello", but what really impressed me is how unique this nail polish really is. It looks like a cement gray in the bottle, but on the nail it's actually a milky grey with a treatment of pale lavender and a dash of dusty pink. The color is quite pigmented and was absolutely gorgeous. I got compliments every time I wore it - from both beauty loving friends and even random men! It applied smoothly and was a thick, creamy formula.Two coats were perfect for provide a gorgeous and opaque finish. The color was completely shiny -- but with no sparkles or shimmer. I applied the polish over my favorite base coat, topped it with my favorite top coat and this color lasted a full five days with only minimal tip wear at the end/sides. As you can see, the bottle is absolutely ADORABLE with a little Hello Kitty pciture on the front as well. This is the perfect chic shade for spring when you want something edgier than a pale pink, but not a bright or very dark nail. One coat could easily work for a very pale nail that looks great on everyone. I love it!" - T.K. Go-->MAC Hello Kitty On The Prowl Nail Polish *If this is sold out online try your nearest MAC store location to see if they still have any in stock.